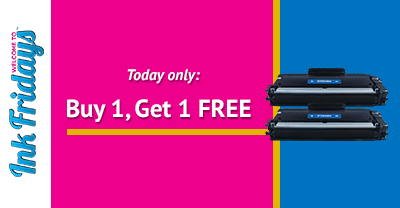 Buy 1, Get 1 Free: Brother TN450 Compatible High Yield Laser Toner Cartridges - Ink Fridays™! It’s double the trouble at CompAndSave this Ink Fridays™! The offer this week is quite a steal: Buy 1, Get 1 Free Brother TN450 Compatible High Yield Laser Toner Cartridges. What this means is that you guys can order each toner cartridge for only $11.50! Just as a heads up, you'll be saving 50% on the average retail price of $45.98 for both. As always, this offer has been exclusively created for and will expire this Friday, April 24th until midnight (PST). Use code FTN450 to get this great deal by clicking here or on the below picture! We always recommend double-checking if your ink or toner cartridges are compatible with your printer model. We gathered a list of compatible printer models with this week's offer on Brother TN450 laser toner cartridges. Our Ink Fridays™ offers rotate every week from toner cartridges like this week, to ink cartridges, and photo paper. No deal is ever the same. If you want a friendly reminder once every week, just join our Ink Fridays™ mailing list here. And....don't forget about taking home this Buy 1, Get 1 Free Brother TN450 Compatible High Yield Laser Toner Cartridges.